My friend Doug Fisher has been operating a Cabbage News Blog for a number of years ago. He's in the neighbourhood loop and "knows things". If you live in the area, he's a must read. Here's a sample from his last posting. Says a lot about one of the iconic coffee shops in the city. Those who frequent Jet Fuel will support no other coffee shop in the city. Call them coffee militants. Jet Fuel (519 Parliament) regularly displays artwork along its walls. This month’s selection comes from Eric Farache. His exhibition entitled “The Jew Funnies” was attacked by a man who objected to its apparently antisemitic content. He was stopped after removing three pieces from the wall and running outdoors to his van. 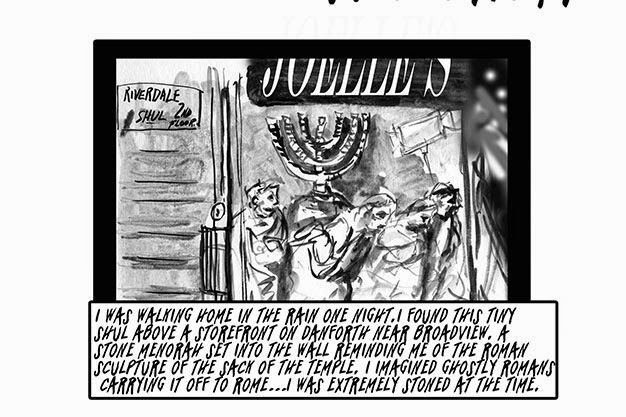 He obviously did not know that Farache is a practicing Sephardic Orthodox Jew whose artwork is the beginning of a book depicting the conflicts and misconceptions affecting contemporary Jews in Toronto. No word about the settlement of the event but it would not be surprising if the laid back staff at Jet Fuel gave the guy a coffee and a biscotti and then invited him to chill out. 1. "I wasn't told how many offers there were." 2. "When it was time to negotiate, I wasn't told I would be at a disadvantage because I wasn't represented." 3. "I think my offer price was disclosed to other buyers." 4. "I didn't know the brokerage was going to represent anyone else in this transaction." 5. "My sales person forced me to offer more than I can afford." Just for the record, no one has ever complained to RECO about any of the hundreds of transactions I've been involved in these past 27 years... NO ONE! A few years ago, we helped a client sell his house in a prime neighbourhood and move to a sub-prime neighbourhood a few blocks away. This new sub-prime area/neighbourhood didn't have a Starbucks but it did allow him to buy a larger and newer house for much less money. As it turns out, a new Starbucks recently opened in his new area. In the past three years, this sub-prime area has shown signs that it's becoming a prime area. We talked about this possibility when he made the move but we had no idea it would begin to happen so quickly. Fifteen years ago, in downtown Toronto, there were certain streets buyers did not want to cross if they were hoping to buy in a prime neighbourhood. There was a time for example when west of Bathurst and east of Pape were ok streets but not great streets. Those days are long gone and the range of quality streets has expanded considerably. The subway line is playing a big role in this shift. Downtown business professionals don't want to spend $20 each day on parking yet they want to stay fairly close to work. The houses along the Bloor/Danforth subway line works well for their lifestyle. Yes, Toronto is changing very quickly. Demand for homes is forcing buyers onto more affordable streets which in turn is driving up not just the value of houses, but the value of neighbourhoods. This is good. Condominium Act of 1998 - Bah! I recall a lot of fanfare over the enactment of the Condominium Act in 1998. It was justified because until then, the industry was lacking in up-to-date regulations and guidelines resulting in many disgruntled condo owners. It looks like our celebration was perhaps a bit too hasty. This editorial in The Star speaks to the effectiveness of the Act in today's terms and it's not good. "Many of today’s residential towers are financed by foreign investors. Many developers have a history of promising more than they deliver, then ignoring complaints. Many property managers are simply not up to the job. The result: Condo owners, led to believe they were buying a worry-free affordable home, discover — too late — that they are unprotected against shoddy construction, sudden hikes in condo fees or shocking repair bills." From my experience as a Realtor who has inspected and sold many condos over the years, I can't say this is a massive problem. I do my research when listing and selling on behalf of my clients and try to suss out the behind the scenes problems with each building/corporation. It is frustrating. No, it's infuriating when I see some condo buildings with falling windows and low water pressure on the upper floors and so on. The developer builds, sells and then disappears into the night with the cash. This stinks and perhaps a revised Condominium Act will hold these characters accountable. I own and live in a condominium. Many of my friends have purchased condos and enjoy living in them immensely. I sell lots of condos to my clients. But, I have a confession to make. I've been feeling more and more disturbed by the "new" Toronto that has appeared on our landscape these past 20 years. This "new" Toronto I'm speaking of refers to the many towers that now dominate our city, the thousands of new condominiums being built and sold each decade. "They are the invaders. Because of their wholesale migration into the city, Toronto neighbourhoods have become mutilated as greedy developers continue their assault on the landscape, shoehorning ugly-as-spit towers into every nook and cranny of available space, building relentlessly upwards. Formerly charming districts have been obliterated and entire rows of long-established businesses dumped on the curb as landowners seize the opportunity to make millions. Others hang on to their boarded up assets until the time is even riper for profiteering." I was going to write a blog entry about "I Don't Know My City Anymore". Much of the old Toronto is gone forever, hundreds of old buildings, neighbourhoods and the like replaced and destroyed. I'm not just referring to the buildings but even the geography is changing dramatically. Some of the changes are great. The Don Lands are the best example. Most of the changes are not so great. But the change that disturbs me the most concerns how little I know about my fellow citizens who vote for a mayor who demonstrates so little respect and tolerance for diversity and fairness. Who are these people? Alas, it is what it is. No turning back now. Maybe I'm just behaving like an old poop who yearns for the old days, you know, when the electorate had some clout and could rally around city councillors and put a stop to the Spadina Expressway and the Scarborough Expressway. Hard to imagine any of us taking to the streets to stop a poorly designed condo tower. Makes me feel great admiration for the Egyptians and the Brazilians to have to demonstrate their democracy on the streets. Sadly, we'll take to the streets someday, but only if a sports team wins something, as unlikely as that may be. There's a blustery outspoken condo developer in town who happens to own a real estate firm. His name is Brad Lamb. He has a lot of experience building and selling condos in Toronto so he should know what he's talking about. Perhaps that is the case more often than not, but not always. He was spouting off in a newspaper article recently about the evils of balconies. He says they cost too much to build (eats into his profits) and people don't use them (he doesn't use his). Does this tall hairless wonder who dresses up as a sheep have no soul? He tells the reader in this article that he personally owns a condo with an enormous terrace. This outside space even has it's own kitchen and yet he prefers to cook and eat indoors. Apparently he doesn't use this space often, but then most workaholics don't use most of the square footage they own. Therefore in his little world, in a survey of condo owners who's name is Brad, let it be said that terraces and balconies are bad. Perhaps he'd prefer a condo development that features hermetically sealed units with recycled air and tinted windows. Who would buy these things? I know. Like minded personalities who shun fresh air, sunshine, birds, flowers and all things related to the natural world. I too have a fair bit of experience selling Toronto condos. That would be 26 years of experience and I can count on one hand the number of buyers who tell me a balcony is not important. My own little sampling of condo owners in the community surrounding my own condominium corporation tells me that the majority of owners frequent their outside space, either to cook, smoke, chat or read. Dogs who dwell in these buildings use their balconies more than Mr. Lamb, but then many of them have a little “pee” area that they visit from time to time. I can think of two downtown buildings that would be worth a lot more if they had outside space. In the Market District there's 65 Scadding Avenue, where you can buy over 1000 SF for $375,000.00. Most of the units I've sold there move to a smaller unit so they can have outside space. Same thing at 15 Maitland Place in the Village. Over 1000 SF, corner unit for $415,000.00. Add balconies to these buildings and you could add $50,000.00 + to their value. Come on Brad. Talk sense man! Some lawyer wrote an article for the Toronto Star suggesting that Realtors will avoid disclosing certain information to their clients. This is my blog and he doesn't deserve to be mentioned by name here. The article is entitled "5 things a real estate agent won't tell you". If he's suggesting some of us hold back information to benefit ourselves, he's right. I know of two who would do that. Pot calling the kettle black if you ask me. 1. Commissions are negotiable. I never knew this to be a secret. Are lawyer fees negotiable? Do they reveal that to all of their clients? 2. Agreements are for 6 months. In order to be submitted to the MLS, the Listing Agreement has to be a minimum of 2 months. The maximum is unlimited but I've never seen one more than 6 months in all my 25+ years as a Realtor. Why any agent or customer would want a one year agreement is beyond me. Do lawyers all work contractually? Or is their service open ended, as long as it takes? 3. Open Houses benefit everyone. There was a time 15+ years ago when open houses were not considered to be a valuable marketing tool. It was a way for Realtors to meet new prospects. This has all changed. Houses and condos that do not host open houses today are denied potential qualified buyers who "only" view houses during an open house. Has this guy ever sold a house? How does he know so much about the value of open houses? 4. Not all real estate is a good investment. The lawyer is correct. I never knew an agent, ethical or otherwise who said otherwise. Where is this guy getting his information? 5. What does a lawyer know about staging? Staging a home will not only get a higher selling price, it will hasten the sale thus saving the seller carrying costs such as mortgage interest, taxes, utilities and the like. Is staging now being taught in law school? If you've ever been involved in a focus group, you'll appreciate the value they offer. Karen participated in a session with her Mastermind group yesterday and the results were helpful and quite interesting. The participants were not selected randomly as they usually are. Rather, they all belonged to the same organization and came from the same socio-economic community. This was facilitated by Wendy Chong, a communications consultant specializing in presentation skills coaching at Elevate Your Presence.. The question was, what do you value in a Realtor? Some of this might even apply to other service oriented professions. I was going to rant about the uncontrolled condo development that dominates the city landscape. Short term thinking in a city like this is too much like rolling the dice with our future. We've not had leadership with any long term vision in this city for 20 years or so. As a city, we don't know who we are so how can we know who we'll be in the future. I was going to write about that but here are some stats that reveal the December Real Estate Blues that overtakes us each year. All I want for Christmas is a good winter/spring market in 2013. When I first arrived in Cabbagetown some 42 years ago, there was a palpable buzz about the joys of moving into a St. James Town apartment. This was "the" place for young professionals to hang their hat and start their professional life in the city. It was so hot, many on city council were ready to bulldoze the entire neighbourhood build more of these edifices. Thanks to Councillors John Sewell and Karl Jaffary and others, this madness was stopped in its tracks. As it is now, the transformation of this complex couldn't have been more severe. It is a go-to destination still but no longer for young professionals. New Canadians have taken over and pretty much dominate the demographic landscape. There is a history, starting in 1870, of this large block of the city in a Newsletter published by the Cabbagetown Preservation Association. It's a great read. Check it out here.